Business owner Carlene Carlson owns and operates Dancing Crane Imports in Salt Lake City. 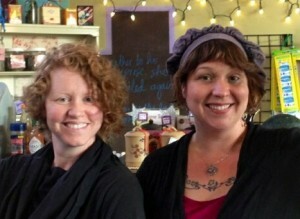 Long-time friend and SLCC schoolmate, Erin Arrigo, owns and operates Café Solstice, which sits inside the emporium. The two say that the educations they received at SLCC prepared them for business ownership. “It taught me more life skills and it taught me that I can do anything that I want to do, or what I set my mind to,” says Carlson. “Being in school helps you to start the learning process…and keeping that going your whole life,” says Arrigo. Carlson and Arrigo teamed up in business just three and a half years ago when Carlson and her husband Jimmy decided to buy Dancing Crane Imports from the retiring owners. Going through school together and becoming best friends helped Carlson and Arrigo forge a respect that has carried them through their business relationship thus far. “It’s been really nice having this kind of relationship—business relationship—between the two of us because not only do we respect each other on a business level, but we’re good friends,” says Carlson. The two women lived in the same apartment complex and became friends while attending classes at SLCC. “The funny thing is, I was her neighbor in a duplex, and she was going to school—hair school—at SLCC, and I was doing my prerequisites. So, we were both in college,” says Carlson. While attending classes at SLCC, Carlson worked at Dancing Crane Imports, eventually becoming store manager and then store owner. Carlson was on the waiting list to attend the Nursing program at SLCC when the opportunity to purchase Dancing Crane Imports opened up. “Later on, I ended up getting married and kept working here [at Dancing Crane Imports], and when the opportunity came I asked [Arrigo] if she’d like to come and do hair or something in this space, and she said, ‘No. How about a café?’” says Carlson. Although Carlson’s dream to become a nurse was not realized, she says she feels like she is still helping people, but in a different way. Education played a key role in helping Carlson succeed in business. Arrigo, who obtained her Cosmetology degree from SLCC, had recently decided to pursue a degree in English and teach when the opportunity to create her own business was presented. Even though she is not using her formal degree in a traditional manner, Arrigo is glad she made the leap into business ownership, and says that her education helped her prepare. Both women take pride in their businesses and the time they spend there, but they acknowledge that it is difficult at times. Carlson says the difficulties are worth the rewards.